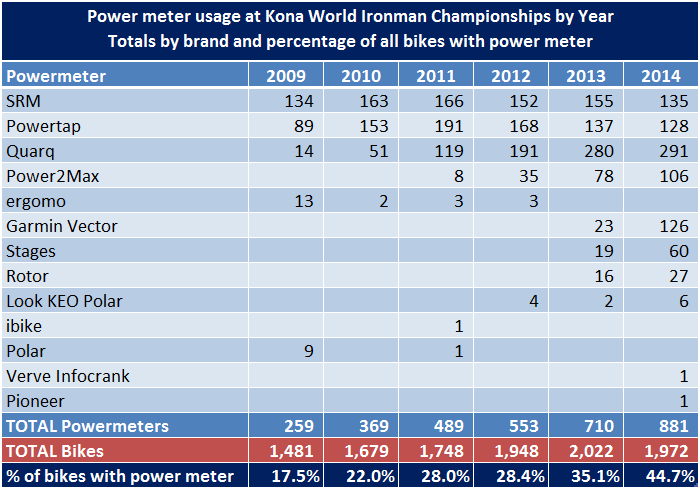 Last year in this post I put together a chart showing the trends in power meter usage at the Kona World Ironman Championships since 2009. 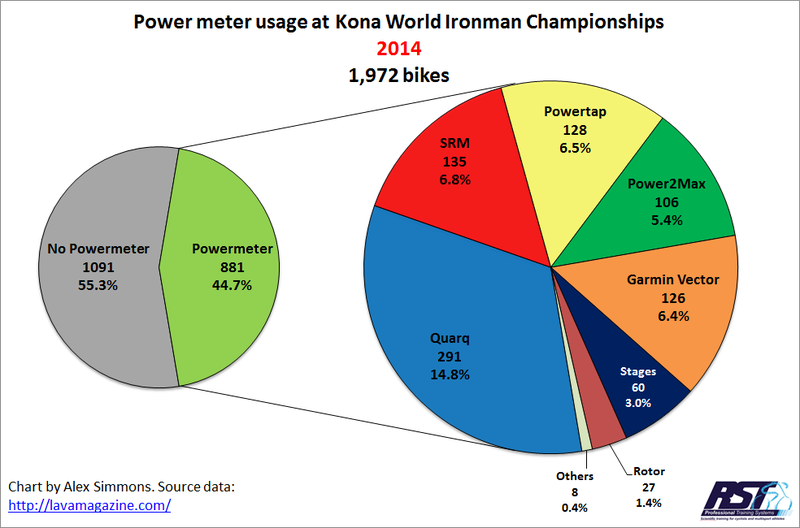 Lava Magazine have once again done a complete bike and equipment count for Kona 2014, and I've been looking at the power meter part of that count. The data I have is preliminary as posted by Brad Culp of Lava Magazine. I'll post the online link with the count data when available. Here's an updated chart and table for the six years from 2009 to 2014. Just click on the image to see a larger version. In brief, we can see there has been a continuation of the strong trend in use of power meters, with 45% of all bikes now fitted with a power meter. 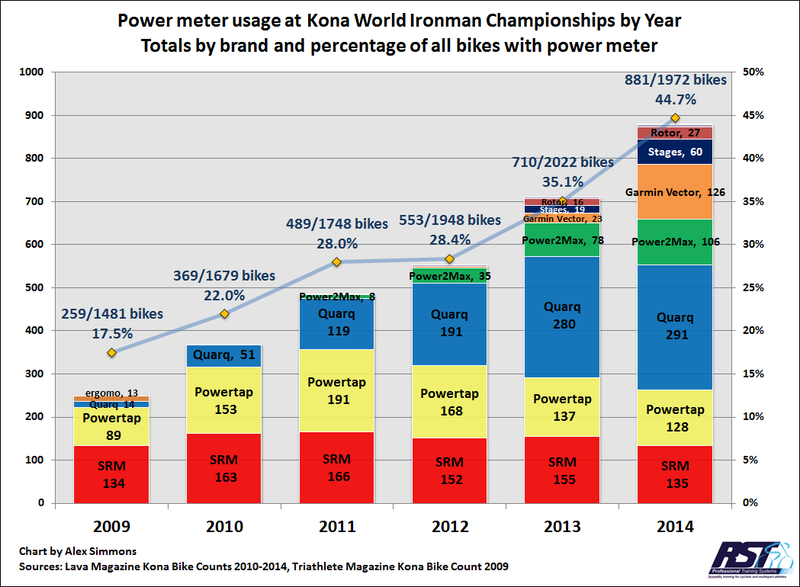 The two long established brands, SRM and Powertap, have fallen away a little in absolute numbers as well as total share dropping, while Quarq usage has grown again and it remains the dominant power meter brand for Kona IM athletes with more than double the usage of the next most popular brand, SRM. Most of the growth in total power meter usage is attributed to the use of newer power meter brands, with Power2Max, Garmin Vector and Stages being prominent in increasing the overall size of the power meter pie. It's interesting to note how evenly split the major power meter brands are. What will 2015 show? I guess we'll see the number of bikes with power meters out numbering those without for the first time.